According to Boxrec, WBC #1 and #2 Anthony Dirrell and Callum Smith are scheduled to meet Sept. 9 for the super middleweight title vacated by Badou Jack. But according to a source inside the WBC, the two fighters might take a detour, with Dirrell instead rumored for a direct showdown with David Benavidez (18-0, 17 KOs). 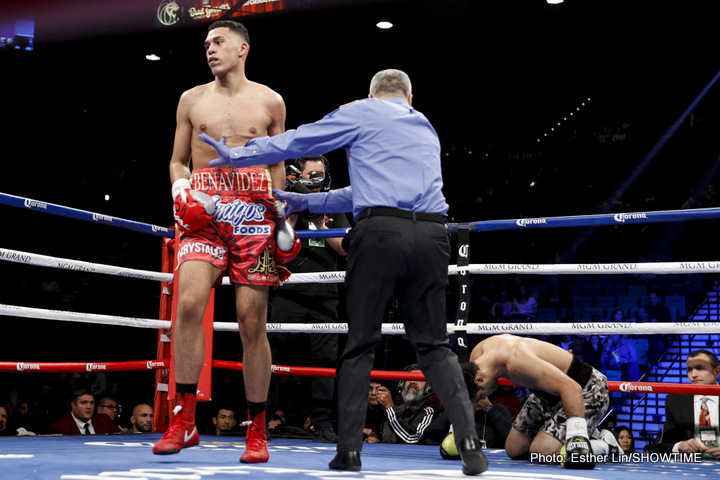 Benavidez, 20, earned a shot at the winner with an emphatic KO8 over rugged Porky Medina May 20 at the Laredo Energy Arena in Laredo, Texas. While unconfirmed, there have been rumors the title fight might not go on due to a recent scuffle in brother Andre’s IBF title fight with Jose Uzcategui on the same date. “[The fight] is not happening. Dirrell and Benavidez are both with the PBC so they can keep that in-house, on Showtime, and [Hearn] can make a bigger money by putting him with James DeGale or in the new [World Boxing Super Series] tournament,” the source said. Smith does have UK options that could net him more quid than a local spat on the American West Coast. Led by Matchroom’s Eddie Hearn, the UK fight scene has seen an economic resurgence, particularly for super middleweight grudge matches — a division historically dominated by Brits like Joe Calzaghe, Carl Froch and half-Brit Mikkel Kessler. However, DeGale, who’s been chasing a rematch with WBA champion George Groves, is scheduled for surgery and won’t be back for the end of the year. There are also whispers that Smith could enter the World Boxing Super Series’ 168 tournament, which just announced relatively Jamie Cox and Erik Skoglund (#4 IBF) as entrants, and would be favored along with Groves to knock out the current field. “I’m 90% sure Dirrell will end up with Benavidez and I think it will be announced soon,” the source ended. You are here: Home / Boxing News / WBC 168 Title Fallout: Dirrell-Benavidez in the works?